The Daleville Cultural and Convention Center (DCCC) is located next to the Daleville City Hall. The DCCC is 11,394 square feet. It features a 74x88 (6,709 square foot) meeting room that can host a 400 person event banquet style. It has a catering area with a stove, an ice machine and a hot bar. There are tables, chairs and a stage with overhead projector and speaker system available for use at the center. Other items such as a piano, linen table clothes and table and stage skirts are available at a very affordable rental price.The DCCC can be rented for various functions such as family reunions, weddings, receptions, meetings, etc. Let the DCCC help you with your next business or personal event. DCCC Reservation Request : Please include name, phone number, email, event date, event time, and type of event in reservation request. 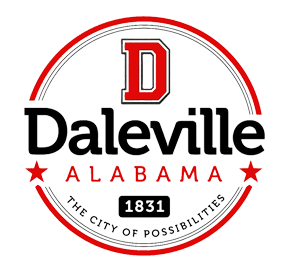 For more information please contact Kecia at Daleville City Hall (334) 598-2345 or adminassistant@dalevilleal.com. Effective August 1,2016 building rental for the Daleville Senior Center will be changed from $100.00 with a $25.00 refundable cleaning deposit to $200.00 with a $50.00 refundable cleaning deposit. Rental charge is only for one-day rental. If renter would like an additional day, for decorating purpose, there will be an additional nonrefundable charge of $20.00. Center members will be allowed a once a year no charge rental, with the exception of all holidays. The rental must be made by member and they must be in attendance at event. Member will be held fully responsible for ensuring the center building is maintained properly and ready for regular activities the following business day. Building key will be kept at the Daleville Police Department. Renters will check the key out at time of rental and return back when center is cleaned. Refund of deposit will be determined by Center Director. Each renter will be given a complete list of required assignments to be performed in order to ensure deposit return. For more information or questions, please contact Laura Leger ( Director) at 334-598-9197 or email at dalesc@dalevilleal.com. You can also reach us on Facebook.